Bruges, Ypres, and the Last Post. Wow. I’m finally getting around to writing this. Almost 3 weeks later! Well, at least it’s 3 weeks rather than almost 3 months late (Amsterdam). This post is dedicated to iamjoe over at the blog Dynamic Flux who asked me for a post on chocolate. While it may not be exactly what you were looking for, this along with the rest of the pics on Facebook do give quite a bit of information! Lucie and I are up, have breakfasted, and are out the door by…oh, it must have already been around 9am. The drive there was nice. Not too much traffic. I’d never driven in Northern Belgium before. I mean, I’d been up there, but it wasn’t me who drove ;). I missed the entrance to the parking garage the first time round, somehow that always happens. So I just drove around the square, took the round-a-bout again and this time we were golden. When we walked up from the garage, it was to find that the square we were in was mostly deserted. Then again, Sunday morning isn’t the busiest time of the week and from what I could gather this wasn’t a super busy area. There was a large fountain at the one end that we took a bunch of pictures of before moving on. We had a map, but didn’t really know which direction to go in. Finally we looked up and scanned the skyline. We saw a few peaks of buildings and decided to head in their directions. Holy moly I'm actually here! The biggest thing we saw was the Belfry in the Markt. Good thing to because that’s where we were originally headed. Again, the Markt wasn’t that busy. It was pretty full when we returned later in the day. There were some people in line for horse-drawn carriage rides, that could have been fun. There were also canal rides we could have gone on, but the line for those was super long and we had a schedule to keep to. So after hanging around in the Markt to take pictures we chose a side street at random and started walking. One of the first shops we encountered was a lace shop. Belgium is also famous for this lace so we had to go in. The women working there was very nice, let us take pictures, – they had an example of how the lace is made on display – and thankfully spoke English. Although, that’s not really a surprise because Bruges is a tourist town. Of course, up there they speak Flemish. Lucie and I both walked away with a purchase and I feel that the items were quite reasonably priced for homemade lace. For me I got a key chain with a lace H in side – a little tacky, I know, but it’s something I can use – and I got two other things, but they’re for gifts and in case the recipients are reading I don’t want them to know ;). Such beauty and art. And all by hand. Dude you want what? There's so much to choose from. What do I do? What do I do!! I didn't know this was City Hall when I took the picture. Huh. It was built in 1376 and is situated in the burg (a square). This is the burg with City Hall on the left and at back-left (attached to City Hall) is the Basilica of Saint Sang(the dark building with gold).The lower chapel was built in 1139 and is dedicated to the Virgin Mary. As we walked we took many pictures – of the architecture, the waterways, the statues. We even got someone to take a picture of us together! We walked through a small tunnel and into another square and – quite by accident – located the City Hall and the Basilica of Saint Sang. I didn’t know it that day, I only just realized what those buildings were today as I was looking through my one guide-book. I remember taking a picture of what I now know to be the Basilica because it was so dark, ominous, and old-looking – truly Medieval (the lower chapel was built in 1139). We found a bench to sit on and proceeded to eat lunch. After lunch we continued on our way. Our goal was the Chocolate Museum. Yes, there is a chocolate museum. They even have free samples they give out. The things you didn’t know about chocolate! Okay, I’m sure some of you already knew these things, but I didn’t. I did know that in South American cocoa beans were a big deal. The first way that cocoa was consumed was in drink form. Hot, spicy, smooth. It wasn’t until Cortez and the Spanish came though that sugar was added. I know it’s commonly known that sugar comes from sugar cane, but did you know it also comes from sugar beets? I only found that out once I got here. This area of Belgium grows a whole lot of sugar beets. Now that they’ve been harvested you’ll pass by fields and see a long, high pile of sugar beets close the road waiting to get picked up and transported to the nearest factory. There’s one about 15 minutes from us. Holy sugar beets. Did you know that 10 cocoa beans would buy you a rabbit, and 100 beans would buy you a slave? They also had special cups for the drink – some even had a special tube you could blow in to create froth. They loved them some frothy cocoa drink. They also had this special ‘stir stick’ that would create froth. Cocoa was also used for medicinal purposes. And not just in South American either.Do you like froth in your hot chocolate? Napoleon was noted as saying that chocolate is good for one’s health and in the next turn he denied it all. It was a drink the wealthy partook of often, creating their own special mugs and saucers just for their chocolate drink. Well if Napoleon said it's healthy, who am I to disagree? Belgium is famous for its pralines. In 1912 after inheriting his father’s chocolate business Jean Neuhaus – an expensive, but oh so good chocolate store – created the Belgian praline. First it was a hazelnut coated in chocolate and then a little filled chocolate cup. Leonidas is also a chocolate shop you see around in Belgium. Leonidas Kestekidès was a Greek who lived in the United States and then fell in love with a Belgian women before settling in Belgium and opening up a tearoom and the Leonidas company. Even the jungle animals are crazy for coca beans! By the way...before this I didn't know that cocoa beans were found in those pods. And someone in this museum must really love LEGO because there were little models EVERYWHERE! There were many plaques like this one including the answers to the questions 'does chocolate make you fat?' or 'does chocolate give you cavities?' See them all in the full FB album! At the end we entered into an area that was full of statues made entirely from chocolate. There was even one of Barack Obama. At the end of this area was a chocolate demonstration and then you were finished – but not before walking through the shop part of the museum. Then it was on to the French Fry museum! Again, potatoes come from South America before making their way to North America and Europe. Potatoes, like chocolate, are also known for their healing effects. For example raw potato juice is incredibly soothing (said a plaque, it wasn’t me). Also, you can eat as many potatoes as you want – they don’t make you fat, it’s all the sauce and gravy you eat with them ;). Why French Fries are called French Fries. Now you know. Have you ever wondered why the fries in Belgium are so yummy? Well, you might if you were here eating them :P. I will tell you why. There are a combination of reasons – the appropriate variety of potato is cooked with the appropriate variety of cooking fat, they are often freshly peeled and cut, they are cooked in unrefined beef tallow and sometimes mixed with horse fat (ummm…), and the fries are cooked in two separate phases. I’ve noticed that. When you go to a Fritterie you will see a pile of fries sitting on a ledge above the cooking area. I was curious about that until going to this museum. They are cooked for a little while and then placed up here. Then when there’s an order they take the appropriate amount and toss them back in the cooking fat to finish them off. This makes them tastier and cuts down on customer wait times. Clever huh? When we finished up there we set out again, intending to head back to the Markt, but we ended up going tin the wrong direction and were going out of the city centre – the old part. So we got set straight and found our way back to a chocolate shop so Lucie could buy some chocolates. Then it was on our way to Ypres, the In Flanders Fields Museum, and the playing of the Last Post. The cloth industry was a the main contributing factor in the rapid growth of Ypres in the 12th Century. The cloth halls were built in 1260 (the IFFM is located here). They were destroyed in WWI, but rebuilt in the old style. The large Menin Gate is a monument to the 54,896 British soldiers who died in combat. * Their names are carved on the walls. Canada was still considered to be British during this time. Although, after the battle of Vimy Ridge it started to gain recognition as its own country. More on that in my post on Vimy Ridge. The In Flanders Fields Museum takes you through some history behind Ypres, detailed information about the war itself and why Ypres, what the German’s objectives were, and so much more. You also get a card at the beginning that you put into information stations and it gives you info on a specific person involved in the war at Ypres. I got an American nurse. I missed the last info station because the museum was closing. So we kind of had to rush through the end, but at least we got to see it. The museum is actually closing November 31 to expand. It’s quite the place already. In one area they had a raised platform with clear plastic columns. In these columns were different gas masks. The lights would be off and there was a reading of the poem ‘In Flanders Fields’. Then there was a reading of a letter written by a soldier (I’m pretty sure) and as he described the war zone and the gas attacks the columns would light up and you could see the gas. It was very eerie. There was also a section dedicated to the telling of how on Christmas 1915 or ’16 (I’m so sorry I can’t remember!) there was an unofficial truce between enemies. How both sides travelled into No Man’s Land to shake hands, wish the other a Merry Christmas, and share things like sausages. The conditions the men had to face here are unbelievable. Belgium usually gets a lot of rain, but during these battles there was more than normal and a lot of things went missing in the mud (including horses). And the psychological damage…it’s a wonder anyone managed to come back and lead normal lives. Unfortunately we didn't think to take a picture before it got dark so it's not the best quality. Here are the rebuilt Cloth Halls now home to the In Flanders Fields Museum. This is either Ypres of Passendale. Can you imagine? I certainly can't. At 8pm every single night there is a gathering of people at the Menin Gate. They place flowers, read something to those gathered, play the Last Post, and have a moment of silence. I can’t remember what they recited because I couldn’t hear it (I’m pretty sure it was in English though). There was never a moment of real silence which bugged me. Even as packed as the area was it was definitely possible. There was a school group from the UK there. Teenagers. Unfortunately the one’s near us were quite disrespectful. Not all (I don’t want to generalize), but a lot. And pushy too. The kept wanting to see. Well, there wasn’t much to see as it was dark and I think the point is more about listening. Lucie and I were right up against the chain you have to stay behind and we were both being pushed so much we almost fell over. If I wouldn’t have had boots on I think I would have had bruised shins. So that was a little frustrating and disappointing, but I’m glad we got to experience it. I have to mention this even though I forgot earlier. For supper that night I had fish and chips. I haven’t had fish and chips in ages! I’m really picky when it comes to this dish because I don’t like it when there’s too much batter on the fish because it ends up being all gooey instead of crispy. Plus I’ve only started to like fish in the last few years. My favourite place to eat fish and chips back home is a restaurant called Joey’s Only. So good. And in Ypres, oh my goodness, I was very happy with my choice. Yum, yum, yum, yum, yum ^_^. So all in all it was quite the busy day! 3 museums, 2 cities, and really good company. I’m just sorry it took me so long to post about it. *taken from my book The Best of Belgium. Today was packed full of stuff. I’m exhausted! I’ll give a short list of what we did so you know what to look forward to tomorrow (I hope). 10:14am: Arrive in Bruges. Find our way to the Markt (Market Square). Found a lace shop right away (so pretty!) and from there, chocolate shop after chocolate shop after chocolate shop. Wandered around this beautiful Medieval city before finding a nice park bench to sit and eat our lunch. Then we went to the chocolate museum and the fry museum. After that we got lost, then we found our way back to the Markt so Lucie could buy some chocolate. Then it was back to the parking lot and on our way to Ypres (Iepers in Flemish). 4:40pm: Arrive in Ypres, try to find parking. Manage to find a spot. Search for the In Flanders Fields museum because we only have until 5 to get tickets. Go the wrong way. Find another museum and get pointed in the right direction. Find the IFFM and are let in just before they close the doors. End up missing the tail end of the museum because they close at 6 and we just took to long looking at/reading all the other stuff! Found a place to have supper. Had fish and chips (me). Was very pleased. So far in Canada the only battered fish I like is from the Joey’s Only restaurant chain. This was so good tonight! Walk around for a bit, wanted to get an ice cream of something, but the shop was closed by the time we were done supper. 7:30pm: We decided to make our way to the gate, which was close, but we went anyway. Good thing we did. Lucie saved our spot and I went to take some pictures of the gate from the entrance outside the city centre. There was a group (maybe school) from the UK. They were pushing, shoving, talking, just being all around disrespectful. Even during the moment of silence. Not cool. Plus we were right against the chain which rested just below our knees and we thought we were going to get pushed over. Lucie got some video of the Last Post being played (just sound, the picture is really dark). There was also the laying down of wreaths. So it was a mini Remembrance Day ceremony – they do this every single night at 8pm. It was really cool, but my feet were sore and I was being pushed in to the chain so I was a bit grumpy. Darn kids. I don’t think they really got what was going on. They would have been high school age I think. 10:30pm: Arrive in Wasseiges. What a day. Got some awesome pictures and some not so awesome (quality) pictures. Some interesting facts about chocolate and fries. I’ll have a bit of time tomorrow, but maybe not enough to really do today justice, so you might have to wait till later in the week. I feel like Wednesday I’m going to be writing the posts for today and Tuesday, ha ha. Today was also my first time driving in the Flemish/Flanders region of Belgium. I’ve been up there once, but I didn’t drive. The difference was just familiarity. I’ve come to realize just how familiar I am with certain stretches of certain highways here. So a very satisfying – and tiring – day. Don’t mind the alliteration. I couldn’t help it. I know this is what you’ve all been waiting on pins and needles for. You’re getting antsy wondering what kind of crazy capers we all got into up there. Wednesday August 3rd 2011. The weather was a little nippy, overcast, and off and on rain. We left some time in the morning, around 9 I think. There isn’t really much to tell about the journey. Lisa listened to her music, I listened to an audio book, and I think we both fell asleep at one point. I actually woke up when we were almost at the stadium where we were parking our car for the Park + Ride. We parked at the Bijlmer ArenA. For those of you not familiar with the Park + Ride system I will explain it. There are about 7 or so stations outside of the city that you can park in and leave your car there for the duration of your stay in Amsterdam. You get metro tickets that will take you to the Centraal Station and bring you back at the end (all included in the price to park). Normally the metro would take you all the way into the city, but there was construction being done so we had to get off of that and take a bus. It was quite the journey, but we made it. Once you get to Centraal (it’s not a typo, it’s Dutch ^_^) you decide what type of transportation tickets you want to buy. We had considered getting 48h ‘I Amsterdam’ cards that include free public transport, free admission to a bunch of museums, and discounts on a whole bunch of stuff. We decided that for the price and what we were planning on doing the cards weren’t worth it. The transit system tickets for 48h were quite cheap in my mind. I think they might have been €11/person or something. And that’s unlimited use of the trams for 48 hours. Good deal I think. Since the two museums we had previously planned on seeing weren’t included in the ‘I Amsterdam’ card they really didn’t do us much good. So instead of paying €48/person to get into more museums than we had time for, and discounts for things we weren’t going to do, we paid the €11/person to get around and the other stuff we would have had to pay for anyway. It ended up working out really well. There were about 5 or 6 lines that would take us right to our hotel. We were just 2 stops away from the Station and our stop was maybe…100ft or so from our hotel. Our hotel. We knew going there that it was only 2 star, but I don’t stay in a lot of hotels so I don’t know what to expect. It wasn’t that bad, really. It actually added to the experience. There was a steep staircase leading up to the hotel (it was above a store). I think there were another 2 floors with super steep/small staircases, but thankfully we were on the ‘main’ floor of the hotel. Since we got there before check-in we were told we could just leave our suitcases in the reception area/breakfast room. The room was small enough that the person at the desk could see the suitcases at all times. So we left to do some wandering. The others had spotted a McDonald’s or two on the way so we decided to walk back to one of them. It was actually my first time eating McDonald’s since last December. We got Big Mac Meals that came with a free ‘Coke’ glass. They came in a bunch of different colours (of course I wanted a green one and Lisa wanted purple), but they only had blue at that time. In Amsterdam there are two things you can definitely be sure of; a McDonald’s and an H&M on almost every block. Literally. It’s ridiculous. After that we headed back to the hotel . When we finally got to go to our rooms only one was actually ready. I don’t know how we decided who go it, but it ended up being Mom and Dad. First thing; small. It’s to be expected and really, they were big enough for what we needed them for. Except for the bathroom. Oh the bathroom. Now, in my family, we’re not tiny people, but even if you were anorexic you’d have trouble with that first bathroom! When you opened the door the sink was right there. There was just enough room to get in and close the door. The shower was on the right and the toilet on the left. But the toilet was practically under the sink! The thing that matters was that it worked. Always try to make the best of every situation because it could always be worse. And it was really warm and muggy in that room. When you opened the windows it was super noisy. Which makes sense because we were right in the centre of town. We didn’t get to see the other room until we got back from supper, but I’ll just describe it for you now. It was the same size as the first, but quieter (because the alley on this side was a lot smaller and you couldn’t walk in it) and not as hot. There was also an air conditioner. The bathroom was a little better, but still tiny. It was just shaped differently. You opened the door and the toilet was right there. You could actually stick your toes out under the door when you were sitting on the toilet. The shower and sink were to the right and the standing space was just wide enough for the small sink. But again, it fit out purposes. I was going to wait to mention this until Part 2, but I might as well say it now. The reason the 1st room was so hot was because the heater was on. I don’t know why it was on, but it was. We didn’t discover this until the 2nd night when Lisa and I switched rooms with our parents. They had hardly gotten any sleep at all the 1st night, what with the noise and the heat, and (especially since they were the one’s driving) we thought it would only be fair to switch. It was after this switch that Lisa and I were at the windows looking out at the alley and the main street that I put my hand on the heater and noticed how hot it was. All that suffering for nothing. We still kept the windows open, but it was about the same temperature as the other room, maybe not quite as chilled, once that heater was off. I couldn’t believe it. My parents never thought to check because even though the sun wasn’t out it was still quite warm outside so why would anyone have the heater on? After depositing our things in the room we left for our first order of business. We had two tickets for the Anne Frank Museum. My Dad had thought a few days before we went that it might be a good idea to get our tickets ahead of time because we know it’s a popular museum. Well, by the time Dad searched for them all we could get was 2. This was for the English introduction. And it was 2 on the 3rd, and there was 1 for the 4th. So he snatched up those 2 and decided that Lisa and I could fight over who would go with Mom. I offered it to Lisa, but she knows that museums/history and things like that are more down my alley than hers so she let me have it. She just wanted to be able to go to the book store to see what they had there. It turns out that if you want to wait in line for hours you don’t have to buy tickets ahead of time and if we would have went as soon as we got to the city, Dad and Lisa probably could have gotten into the museum as well. Yeah right, like they’d want to wait that long! And the tickets you buy from waiting in line don’t include an introduction, it’s just the museum. Because Mom and I already had tickets we got to go in a side door all sneaky like and wait for our introduction inside. I won’t take the time talking about Anne Frank because most of you already know the story and if you don’t it’s so widely accessible you can find out about it easily if you’re so inclined. It was really neat to be inside the house where they hid. I haven’t read the book yet (although I bought a copy there), but I’ve seen the play. I can’t really comprehend what it would have been like not to be able to make noise when you needed to, or to not be able to get fresh air any time you wanted. I guess people are capable of a lot of things when their lives depend on it. We took a little longer at the house than we thought so Dad and Lisa were at a bit of a loose end for a little while, but eventually we saw them again and let them in through the ‘sneaky side door’ (it’s actually on the same wall as the main entrance) as long as they promised to only go into the book store. By that time we were hungry so Dad and Lisa guided us to this restaurant they had found that served up a platter of traditional Dutch food. It was quite the platter, let me tell you. It had 3 or 4 different types of meat, that mashed potato/carrot concoction that I always forget the name of, and then in bowls on the side were more potatoes and other veggies. We all got plates and then just dug in. The amount we got could have fed 6 or 7 people and we had to stop my Dad from eating when he was clearly way too full and just kept taking stuff because it was sitting there. He was being quite the joker about it. We had to hide all the cutlery. Mom got a bottle of wine that she was able to take with her if she didn’t finish it. I felt sort of odd carrying an opened bottle of wine out of a restaurant in my backpack…. Our waiter was really nice. My Mom kept saying he looked like he could have been the younger brother of a friend of theirs who was in their wedding party if said friend (Rob I think) would have had a younger brother. We ended up asking him if we could take a picture of him. He said yes even before we explained why. Again, awkward. Actually, I’m the one with the picture, so I have to remember to email it to my Dad. It was good, by the way, the food. I know I have a picture of it all, but except for that I couldn’t tell you what the meat was or what the platter was called because as you’ve all figured out by now I have the memory of a…well, not an elephant and I never write things down. One thing we had to be careful of with the trams is that on different lines there might be the same stop name, but it won’t be the same stop. It will be in the same area, but a street over or something. We figured that out trying to get back to the hotel. To get right to the hotel the 9 and 4 (among others) were perfect. The 1, 2, or 5 got us around it, but we had to still find our way from the stop. I’m not sure what we did exactly after dinner. We must have hung out at the hotel for a while because it was still light out when we got back there, but it wasn’t until after dark that we left again. I’m drawing a blank, unless we didn’t actually do anything and then that makes sense. That night anyway, we went to the Medieval Torture Museum. Nothing like looking at crazy painful ways of getting people to talk to get you in a good mood. It took us a little bit to find it because it was dark and all, but it wasn’t actually that hard. We were the only one’s there (by this time it was 10pm I think). We napped! That’s what we did after supper. Now that that’s taken care of… The others just sped through, but I took the time to actually read the plaques which, although gruesome in their descriptions of the methods and devices involved and the reasons one would be picked for such a torture, were actually quite cleverly written, enough so to be slightly amusing. I started reading them aloud because the others weren’t bothering to take the time and for some reason they just sounded better with a British accent. Or at least my attempt at a British accent of some sort. Eventually I gave up on the ‘aloud’ bit and just read them for myself. At this point they had completely lost me. Well, at least they were able to rest at the end while they waited for me to finish. When we left I’m not sure why we didn’t just go back the way we came. Maybe we started to, but we definitely got lost somewhere along the way. I can’t even remember if our plan was to go straight back or not. At one point my Mom was completely outraged because some guy was talking on his phone, his dog took a crap on the edge of the sidewalk (which he was clearly aware of), and when it was finished he just walked away. There’s not much ‘poop and scoop’ enforcing there. Eventually Lisa and I got ahead of the ‘rents. We must have looked like we knew our way around (I didn’t have my backpack on, maybe that was it) because we were stopped by this young couple who asked us how to get to another museum. Of course, we were as lost as they were so we weren’t much help, but we all did our best to help each other. We ended up chatting a bit and found out they were from Australia. The guy was 30 and this was the first time he’d ever gotten a passport. I guess, if we didn’t need one to get in the States, that would be my story to, just not the ’30’ part. They were really cool and we shared stories of why we were there and stuff like that. Don’t you just love those kinds of encounters? So as you can see, even though we didn’t ‘do’ that much stuff we still had an action packed 1st day. Yes, I know, super long post and it’s only one day! For your sake I’m spacing it out a bit ;). Stay tuned for AAA (Part 2), coming to a computer near you. Do you live in Huy? Oui! Well guess what? Rain. Lots of it. About as much as when I went to Villers-la-Ville on Tuesday. Why is it that when I plan on going out and doing something it rains? I do check the weather forecast, but when there’s always a ‘chance of showers’ you just have to decide to do things anyway. It actually wasn’t too bad and stopped sometime after I was inside. Adeline pointed something out to me today. I’ve gone to a lot of World War memorials/museums. Part of this is because it’s a part of history I find interesting (if extremely depressing) and partly it’s an accident. When I went to Huy today I’m not even sure if I knew or not that inside the Fort there is a WWII museum. The town is only about half an hour from Wasseiges and is quite beautiful nestled along the River Meuse. It reminded me a lot of Dinant and Namur, mostly the bridges. I didn’t actually see much of the city itself because it was raining and I spent quite a bit of time (about 2.5-2.75 hours) at the Fort. To explain the title: Huy sounds a little bit like oui, but more like oo-y. I had to ask Greg this morning how to say it because I wasn’t sure. This next bit is thanks to a handy pamphlet I got there today. The Fort was constructed between 1818-1823 on the site of an old castle that had been demolished in 1717. There is something that remains of the castle though; an old 16th well, 90 meters (295 feet) deep. It’s quite the space. In May 1940 to September 1944, the Germany army turned the Fort into a detention centre guarded and controlled by the army and the secret police. There were more than 7000 prisoners of many nationalities imprisoned there during that time. Hence the memorial museum. Now, the only thing in English was the pamphlet I picked up and some snippets of British newspapers. The rest was French, Dutch, or German. There was a lot to read and thankfully I know enough to at least try to understand. I actually kind of surprised myself today. Normally I would have just skipped by a lot of the articles and things without even trying to read them, but today I took my time and was able to glean some information. Some of the stuff I read about I was familiar with because of history class and my previous visits to other memorials (like the Dachau Concentration Camp), but some was new. It was quite sobering with all the pictures and accounts. It also talked a lot about the Belgian resistance to the Germans. I passed a couple of people leaving as I was coming into the Fort and I didn’t see anyone else (besides the person in the ticket booth) until I left. I think I was literally the only person in the Fort during that time. It was a self guided tour, at your own pace, no audio guide, just looking at stuff and reading things. There were a lot of mannequins around and every time I would see one when I hadn’t in a while I thought it was a real person and it freaked me out! It was, I think, more sobering because I was the only one there, I had no other distractions. I could literally take as much time as I wanted/needed. The Fort itself is quite large. By the time I went outside up to very top to see the panoramic view of Huy it had stopped raining. It was windy and overcast, but I could actually see my pictures because the sun was hiding so in a way that was really nice. The view was spectacular. Similar to the views I saw in Dinant and Namur (in Namur just Dad and Jean went all the way up and I haven’t seen the pictures yet), but because it was flat at the top I could see an unobstructed view in every direction. Well, almost unobstructed. The towers for the cable car kind of took away the feel of the place. As did the bright orange fencing in some areas. Also, while I was top side I heard a very sickly version of Beethoven’s 9th Symphony (I think I got that right), you know, ‘Ode to Joy’. It made me sad because it sounded like the instruments were dying. I’m not exactly sure where it was coming from, but it wasn’t the church (which is very close to the Fort and started playing something else after). I couldn’t help but cringe. I had a late lunch at this Italian/French restaurant. I’m not a very adventurous person when it comes to culinary delights. I tend to stick with what I know, especially when I’m hungry. And besides, pasta is just tasty. It was quite a tiny place, room for about 30 or so. There were two other patrons when I got there. It was also almost 2 in the afternoon. The whole front was a big window (or 2 and a door) and one part as well as the door on the other side were open and I was able to hear the jazzy stylings of a trombone player next door. I think he was just playing a mixed CD with soulful songs and accompanying them with his ‘bone. It created quite the comfy atmosphere and was better than the music they had in the restaurant (I think it was just the radio). It was just the right volume too. Loud enough to drown out the radio in the restaurant, but not too overpowering. When I got back I hopped on to check the blog of a Canadian girl living/working in Liverpool. I read a few posts and did some other things before leaving to pick up the boys. It wasn’t until after supper when I came back on to read the rest of her posts that I realized I actually know her! Not only do I know her, but we went to university together and she was my accompanist for my vocal recital. I only figured this out because she included a Facebook link to an album with Liverpool pictures and I clicked on it. Imagine my surprise! It’s really interesting reading her point of view on living in another part of the world. We have different jobs and different challenges, but some things are the same. Hey Becky! I think Huy is a place I’d like to go back to on a nice day when I can wander around a bit, especially since it’s so close. But, as there is still a lot to do and see we’ll see how that goes. I have to start adding in some other stuff! Like a mine and a brewery. There are plenty to choose from. One thing I thought of just now that I forgot last night; some of the movie (Rien à Déclarer) was filmed in Chimay. I’m pretty sure. Remember when I spent that one afternoon/evening in Momignies with Christel? Well, Momignies is really close to Chimay. Just thought that would be interesting to point out. A little ‘geography’ lesson. Pfft. Lesson, yeah right. 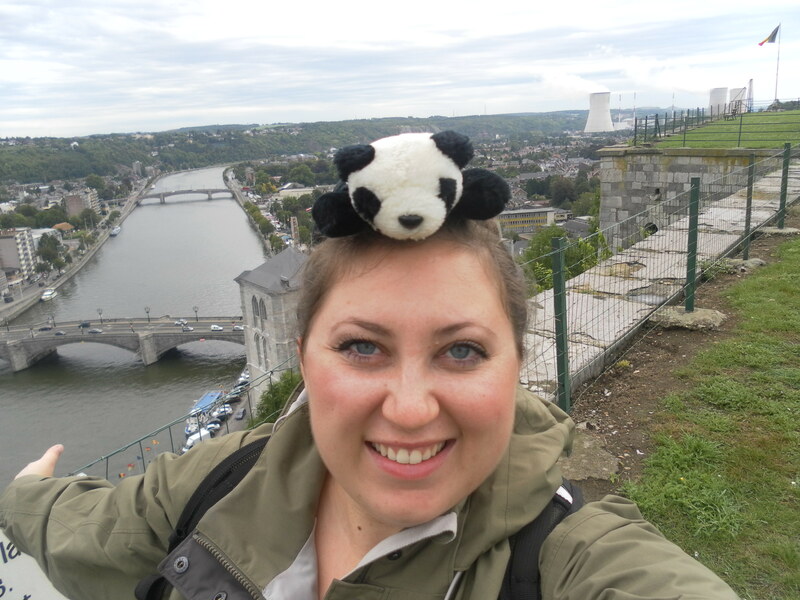 Freddy, me, and the River Meuse. Top-side on the Fort de Huy.